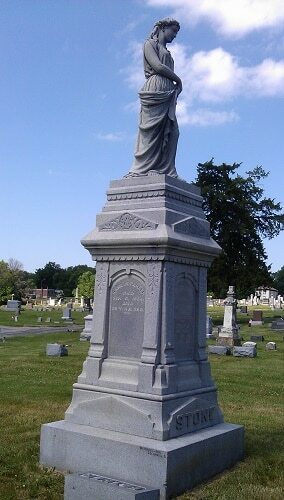 In the family plot of Napolian Bonaparte Stone in Woodlawn Cemetery, about a half mile from our inn, a tall monument has a panel marked, “SAML. M PARKER; DIED; SEP. 8, 1864; AGED; 28 Y. 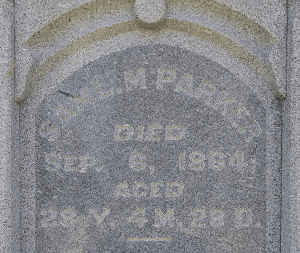 4 M. 28 D.” In the northeast corner of the family plot, likely the first to be buried there, is a headstone with the initials S. M. P.
Exactly who was Samuel M. Parker, and what relation does he have to the Stone family? The patriarch Napolian Bonaparte Stone (1818 – 1883) built the house that would become Silver Heart Inn about 1856. Our realtor gave us some great information about the Stone family before we bought the house in 2012. Soon after we purchased the home, I located the Stone family plot at Woodlawn. The grand monument stands over fifteen feet tall and is topped with the statue of a beautiful lady. It is the prettiest monument in the entire cemetery. I always wondered why there was a panel dedicated to Samuel Parker on the monument. He must have meant something to the family to be included in the family plot. I also wondered if his death at a young age had anything to do with the Civil War.  Years passed, and we became preoccupied with improving the Bed & Breakfast. A 160 year-old house is in constant need of attention. A new roof here, a hot water heater there, a major renovation of the columns holding up the porch roof. New and renovated bathrooms. Projects great and small that took a lot of oversight. But thankfully, we are now at a point where the MAJOR tasks are mostly done, and we can continue to research the Stone family. We knew that Napolian Stone and his wife Emily had three daughters that lived to adulthood. 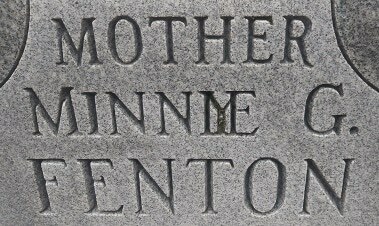 Annie was born in 1846, Addie in 1854 and young Margery in 1858. Margery was probably born in our house. We also knew that oldest daughter Annie married Col. John T. Crisp, a gregarious, larger-than-life figure that served in the Missouri state legislature. Physically large, he was sometimes known as Jumbo by his detractors, and he was ever ready to deliver the most heartfelt speech in a booming voice. 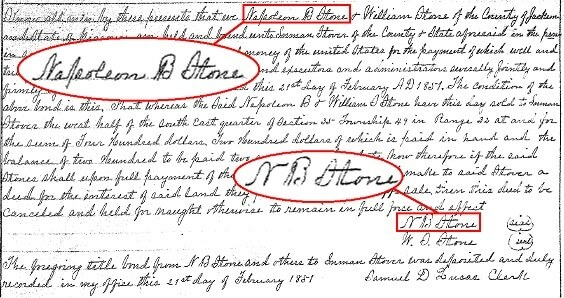 Recently, Jackson County has made many records and documents available online, mostly deeds and marriage records. Curious, I looked for some information on the Stone family. I could find no marriage record for a groom named Crisp and a bride named Stone. Were they married in another county? 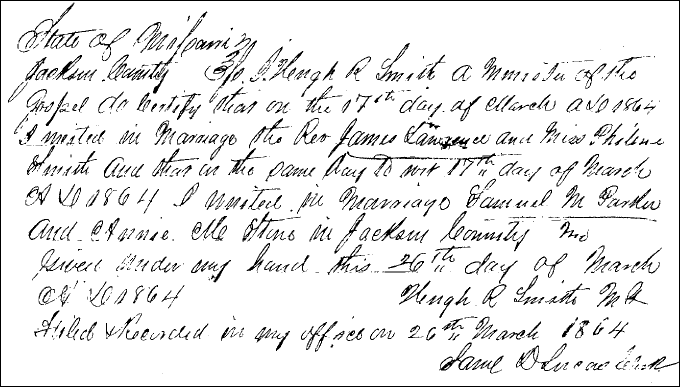 However, when I looked only for a bride named Annie Stone, it turned up a marriage record from 17 March 1864 for Annie M. Stone and none other than Samuel M. Parker. Parker was Annie’s first husband we never knew about! Samuel Parker was the most junior of junior partners in business with his future father-in-law. Twenty seven year old Samuel married the boss’ seventeen year old daughter Annie in March of 1864. He died the following September, which explains his burial in the Stone cemetery plot. We have been unable to learn the cause of Samuel’s death. He may have succumbed to disease, such as cholera. Or the Civil War, raging in Missouri at the time, may have been the reason for his death. Samuel was a bit old for military service, at age 28. If he enlisted at all, it would probably have been with a Union Home Guard unit or state militia. Such units were employed in rooting out and engaging guerilla fighters throughout the state. However, I can find no record of any battles or skirmishes in the vicinity of Independence that incurred casualties within two months prior to his death. But even if Samuel was not a combatant, he may have been a casualty of the war. Guerilla bands and nervous militia patrols made it extremely dangerous to travel. When stopped and challenged by armed men on the road, the wrong word could lead to summary execution. On the 21st and 22nd of October 1864, just over a month after Samuel died, Confederate Major General Sterling Price fought a running battle through town (known as the Second Battle of Independence) en route to defeat at Westport. In a daring sweep through the state, the long anticipated Price’s Raid was a final, failed attempt to arouse the southern sympathies of the citizens of Missouri, and possibly affect the outcome of the 1864 presidential election. It was the last major military operation west of the Mississippi. Among the cavalry officers in Price’s Army of Missouri was a 26 year old Lieutenant Colonel John T. Crisp. Born and raised in Chapel Hill, Missouri in nearby Johnson County, this area was familiar to him. Did the young cavalry officer meet newly-widowed Annie at this time? John T. Crisp and “Mrs. 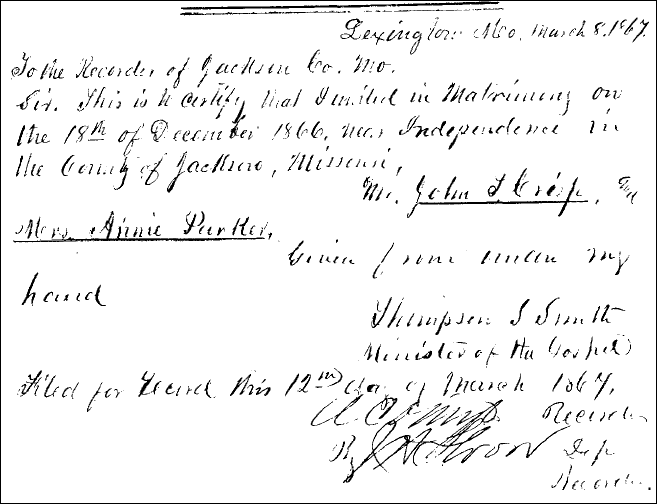 Annie Parker” were married on 18 December 1866. They had five children and remained married until John’s death in 1903. Their eldest son, Napoleon Bonaparte Crisp, was named after Annie’s father (without the quirky spelling). Another son, Greenville Crisp, was named for John’s father. The marriage of Annie and John T. Crisp demonstrates that loyalties were not so clear during and after the Civil War as we generally believe now, especially in Missouri. The daughter of Napolian Stone, an avowed Unionist, married a former Confederate cavalry officer. After the war, there were many matrimonial and political unions that joined former enemies. For example, the Missouri Democratic Party in the 1880s, to which John T. Crisp belonged, was made up of an alliance of Union men and ex-Confederates. Finding new information about the Stone family was very exciting, and there is much more to be discovered. Other than a couple of photographs of John T. Crisp, several deeds and records and some newspaper articles, we have very little information on the family. Fortunately, given time, there are many new sources to explore. If you have any information about the Stone family, please share it with us.